What is the Learning Agenda? By 2007, Tanzania achieved 97 percent enrollment among primary-school aged children. However, although primary school enrollment is high, students’ performance—albeit improving—remains poor. Over the last decade, pass rates for the Primary School Leaving Exam (PSLE), an exam taken at the end of Standard 7, have ranged from a low of 30 percent in 2012 to nearly 60 percent in 2011 (MoEVT 2015). In 2016, 67.8 percent of Tanzanian students passed the PSLE, suggesting that education reforms, teacher training, and other interventions may be effective. Still, students’ early grade reading and math outcomes at Standard 3—although improving—remain poor and below government targets, indicating that students are not acquiring foundational academic skills. The 2016 Early Grade Reading Assessment (EGRA), for example, measured primary students’ literacy, and the 2016 Early Grade Math Assessment (EGMA) measured numeracy (RTI 2016). Only 25.9 percent of students performed at benchmark on reading comprehension, falling short of the 2016 target of 37 percent. About one-quarter (26 percent) of students scored zero on reading comprehension (an improvement from 40 percent in 2013). For oral reading fluency, 16.1 percent met standards, falling short of the 2016 target to reach 26 percent. About 17 percent of students scored zero on this task, which is down from 28 percent who scored zero in 2013. For addition and subtraction, only 26.8 percent met standards, falling short of the target to reach 40 percent. About 32 percent scored zero, which again is an improvement from 2013, when 43 percent of students scored zero (World Bank, Big Results Now 2016). Given students’ underperformance in learning outcomes across the primary grades, Tanzania is striving to improve teacher quality and effectiveness, the learning environment, and other factors critical to student performance. Policymakers and implementers have increasingly focused on early childhood education (ECE) given the growing global awareness of the critical role that quality pre-primary education plays in laying the foundation for improved school readiness and learning outcomes. Further, there is persuasive evidence that investments in quality early childhood education yield an estimated return of 7 to 16 percent annually for programs that target vulnerable children. Earlier investments in human development are cheaper and more impactful than compensatory programs later in life, which are more expensive and less effective. We assessed pre-primary children to gather preliminary evidence on learning and development and explore whether Fursa kwa Watoto (FkW) leads to improved student outcomes among pre-primary students. Children’s cognitive, social, and self-regulatory skills have all been found to improve learning outcomes throughout their school careers. This study provides full picture of student’s pre-academic skills and executive function, as well as allow us to assess trends in student learning and development based on the schools’ intervention status (FkW versus control schools). We assessed student learning and development using the Measuring Early Learning Quality and Outcomes (MELQO) tool. 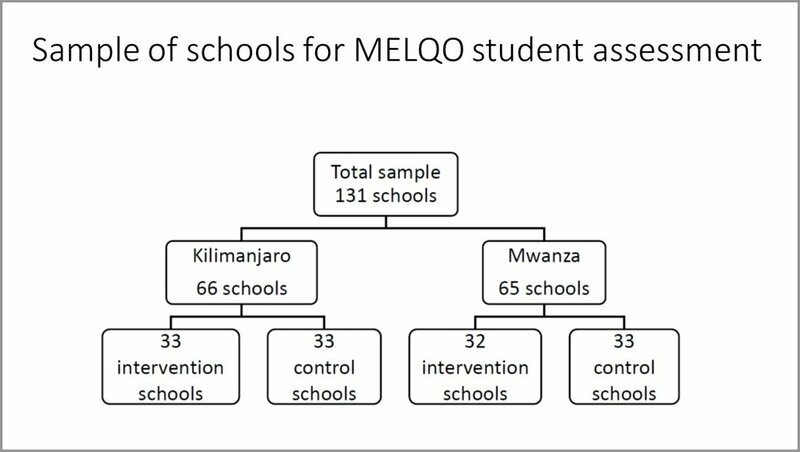 The MELQO Consortium—which includes UNESCO, UNICEF, the World Bank, The Brookings Institution, the Global Partnership for Education, and the World Health Education—developed and validated the MELQO. The tool can be used with children ages 3 to 6 and takes about 35 minutes to administer. MELQO assesses pre-literacy, pre-numeracy, and socio-emotional skills, and areas that support learning across multiple domains, such as executive function, persistence, and self-regulation. We conducted the MELQO assessment at two points, in May and November 2017. Our sample includes 131 randomly selected schools in Kilimanjaro and Mwanza regions. Schools were randomly assigned to the FkW intervention or the control group so that the study groups were similar on school-level characteristics before the intervention was implemented. Our field team worked with teachers to group students by age. In each of these schools, we listed the children’s ages and randomly selected 12 students—ages five or six—to participate in the assessment. We plan to follow the students for one additional year and conduct a follow-up assessment that combines MELQO and items from the Early Grade Reading and Mathematics Assessments, which are appropriate for older children, in order to assess whether the effects of FkW persist one year later. At baseline, student scores were comparable across the intervention and control schools. However, students in Kilimanjaro tended to perform better than students in Mwanza, likely due to regional differences in socioeconomic status and levels of overcrowding. At midline, we find that FkW is having positive effects on pre-numeracy and health knowledge outcomes in Kilimanjaro, but no statistically significant effects in Mwanza or overall. ¹ Naudeau, Kataoka, Valerio, Neuman & Elder, 2011. © 2018 Mathematica Policy Research. All rights reserved.